Alumni Quad in the summer of 2016. Update update: The rescheduled public meeting is March 8 in the Husted Hall Amphitheater on the downtown campus at 6 pm. Update: This public meeting has postponed to a later date because of weather. 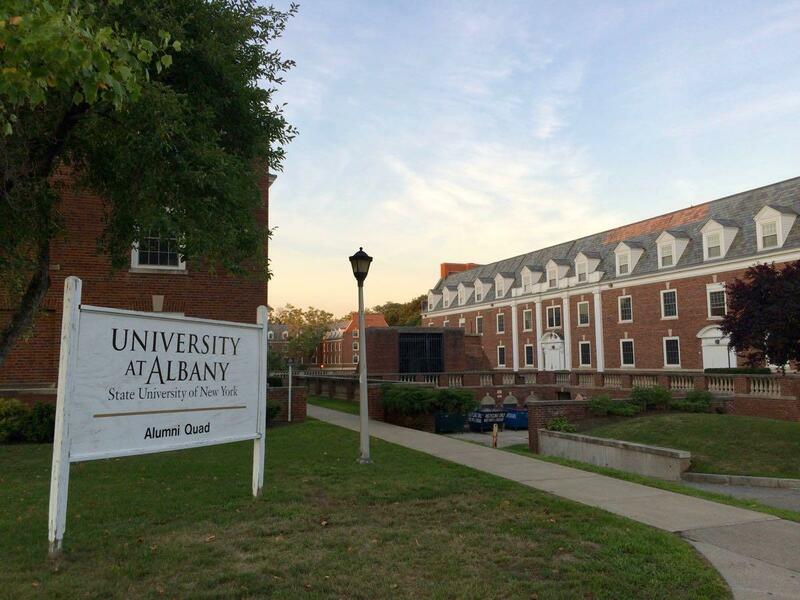 UAlbany is thinking about the future of its Alumni Quad -- an almost-10 acre piece of land that sits right in the heart of Albany's Pine Hills neighborhood -- and it's looking for some community input about that possible future. There's a public meeting about those plans February 7 on the downtown campus. The university says officials will be talking about the current state of Alumni Quad, what's in the works for there, and then they'll throw it open for comments from community members. Here's a little bit more about UAlbany's thinking about, along with a few things about how it connects to some other projects and the wider neighborhood. Alumni Quad sits on the north side of Western Ave between O'Leary Boulevard and Ontario Street. That's two blocks uptown of the downtown campus, a little more than a quarter mile. It consists of five residence halls. Four of them house roughly 800 UAlbany students. The other houses about 400 St. Rose students. The quad dates back to the 1930s when it served as a residence hall for the teachers college that would become UAlbany. The youngest of the current buildings date to around 1960. And those buildings are showing their age. Because of the condition of Alumni Quad -- let's call it lived-in and old-school -- it is not a preferred choice among students for housing. So UAlbany is looking to make upgrades. "How do we make it a place where students want to live," said university spokesman Jordan Carleo-Evangelist this week, who noted that students much prefer the newer, suite-style housing options on the uptown campus. "We want students to be in midtown -- especially students who are taking classes on the downtown campus, we want them to be able to live nearby." Whatever the final plan, construction wouldn't start until 2019. Part of the Elkus Manfredi study of the options for Waterbury Hall includes talking to all the various constituencies that might have a stake in the project, including students, staff... and the public. Alumni Quad backs up with the city of Albany's Beverwyck Park. Along with a handful of other campus-style parcels that stretch to the west, including Albany High School, they make up a large slice of the neighborhood -- a section with which many members of the public probably don't have much interaction, despite it being (almost literally) right next door. So Jordan Carleo-Evangelist said UAlbany and the architects are interested to hear from members of the public about how they currently interact with the Alumni Quad area (or don't) and ways it might be better integrated with the neighborhood. A rendering of UAlbany's hopes for the Schuyler Building conversion. Zooming out a bit, the plans for Alumni Quad are part of UAlbany's ongoing effort to both grow the downtown campus and better connect it with the uptown campus. A big part of that effort is the university's goal to convert the Schuyler Building at Western and Lake into the home of its new engineering college. Carleo-Evangelist said exterior work on the building is scheduled to start in March, and the university is again seeking $20 million during the state budget process for phase one of the interior renovations. He said UAlbany is hopeful it will land the money because enrollment in the new college continues to grow, which demonstrates demand. "It's a little stressful because we have to find space for [the students]," he said. "But it's a good problem to have." If/when the Schuyler Building conversion goes through, it will mean the addition of roughly 1,000 new students, staff, and faculty to the downtown campus. So having many of those new engineering students living at Alumni Quad, traveling back and forth between the downtown campus just a few blocks down Western, could also mean the infusion of new activity and foot traffic for the surrounding neighborhood. 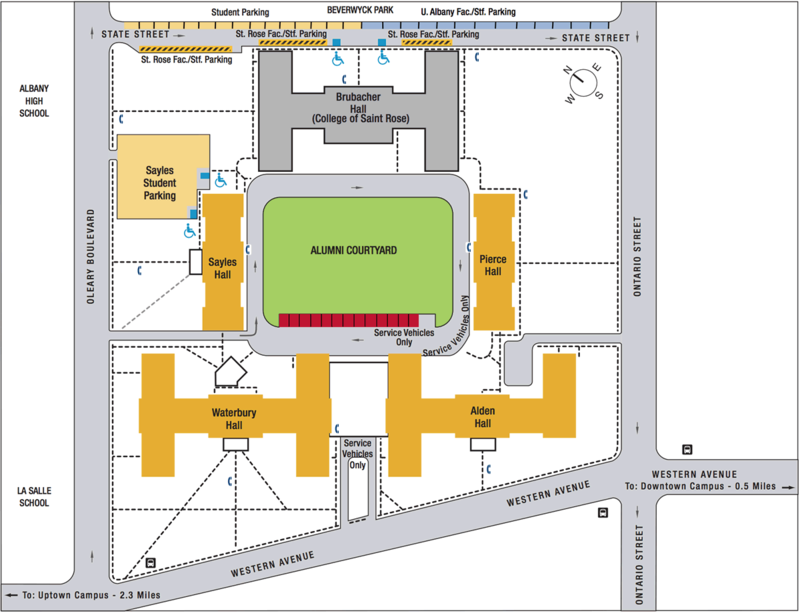 The public meeting about plans for Alumni Quad is Wednesday, February 7 from 6-7:30 pm on the UAlbany downtown campus, Milne Hall Room 200. If the intensification of the downtown campus goes according to plan and 1000 new students, faculty, and staff relocate there, there will be a significant increase in traffic between uptown and downtown campuses. Almost anyone who is based downtown has to come uptown on a regular basis. This could cause significant disturbance in the surrounding neighborhood. There will need to be significantly improved transit and safe bicycle options between the two campuses. A bus rapid transit line with protected bicycle lane alongside looks to be the only way of avoiding carmaggedon. This infrastructure needs to come on line before downtown intensification starts to cause havoc. Perfect opportunity for a series of gondolas!!!! Any type of rail will never be funded by the Trump and the Rethuglicans. They should add something the neighbors can share on the ground floor facing Western. A starbucks? a bagel place? Since SUNY is investing money in the Schuyler building and Alumni Quad, shouldn't the landlords invest theirs to upgrade the shabby student section of town? I believe there was actually a recommendation from a few years ago to build a parking structure across from the downtown campus, on the footprint of the existing parking lot. They could use this as overflow parking for the residences, and get that "purple" line up and running to shuttle students, faculty, and staff. Just to follow up on some of the comments people have made above about bus rapid transit... I think both CDTA and UAlbany would be very happy to see that Purple Line project come about. It's just a matter of getting the funding. And Jordan Carleo-Evangelist mentioned that the not-yet-released Nelson\Nygaard study would look at transit. @jsc: Re: landlords and rundown properties... I've talked about the issue with some city officials recently. I think there's hope the city's recent efforts to get its property data organized will allow it to consistently apply more pressure to problem properties through code enforcement. And one person mentioned the idea that new student housing options provide competition to these typically-rented-by-student off-campus apartments. So maybe that will prompt some changes, too. @Neighborhood Curmudgeon: The idea of a parking garage has popped up a few times in recent years -- it was a topic of discussion during the Rezone Albany session about the neighborhood. But Jordan Carleo-Evangelist said a parking garage is not something UAlbany is thinking about in the short term. Despite living most of my life in and around Albany I have never walked through Alumni Quad, and I have walked through most parts of the city. It wasn't until I read this article that I realized it is because the quad is not at all inviting. Specifically, the space that I would enter the quad from, the space where the main entrance should be...is used by garbage trucks instead. The area I am referring to is, of course, between Waterbury and Alden Halls just north of Western Ave. Instead of service ramps and loading docks UAlbany should enlarge the courtyard between the halls and install an arch--thereby creating a literal connection with the city. And if they want to get a bit ambitious, then why not create a pull off for the UAlbany shuttle in front of that new courtyard. This would be a good start. Along similar lines...what is that random sign for the University at Albany (with Alumni Quad in smaller type) doing randomly sitting in front of the southeast corner of Waterbury Hall? Why is it set back from the road? And why is UAlbany using a typeface with narrow uprights? I didn't know this sign was even there until I walked around on Google Streetview. Put your sign where the people are! Students enter this campus from the bus stop at the northeast corner of Western and Partridge, and then either go north along Partridge, east along Western, or directly down the sidewalk into Waterbury Hall. That is where the sign should go! And, design-wise, take a look at the College of Saint Rose sign at Partridge and Madison to get an idea of how a sign can be integrated with campus architecture. I have peaked into the inner quad once or twice and each time have thought that it could be an attractive green campus quad but large parts have been paved for parking and sort of ruin that. I'd recommend un-paving the quad and designing a classic attractive leafy campus quad. Students and neighbors love that aspect of campuses - that's one of the big draws of colleges both for students and their surrounding neighborhoods.